School programs at the Thomas Cole National Historic Site promote learning through student participation in history, art, literature and preservation. Our programs encourage students to explore in new ways, making history come alive. By participating in the Thomas Cole Historic Site’s school programs, students will build higher level thinking skills while investigating the life and times of America’s most influential landscape painter, Thomas Cole. Students’ investigations begin when your class receives a package of evidence in the mail as the basis for pre-visit activities. The evidence includes documents, photographs and a powerpoint presentation introducing the class to Thomas Cole, the Hudson River School of Art, and Cedar Grove. Afterwards the students visit the historic site and explore more evidence about the life and creative output of Thomas Cole. Students examine data, gather information, and draw conclusions from their personal experiences. All school programs meet New York State learning standards for grades K-12. The students will visit the historic home, studios, and grounds of the Thomas Cole National Historic Site. 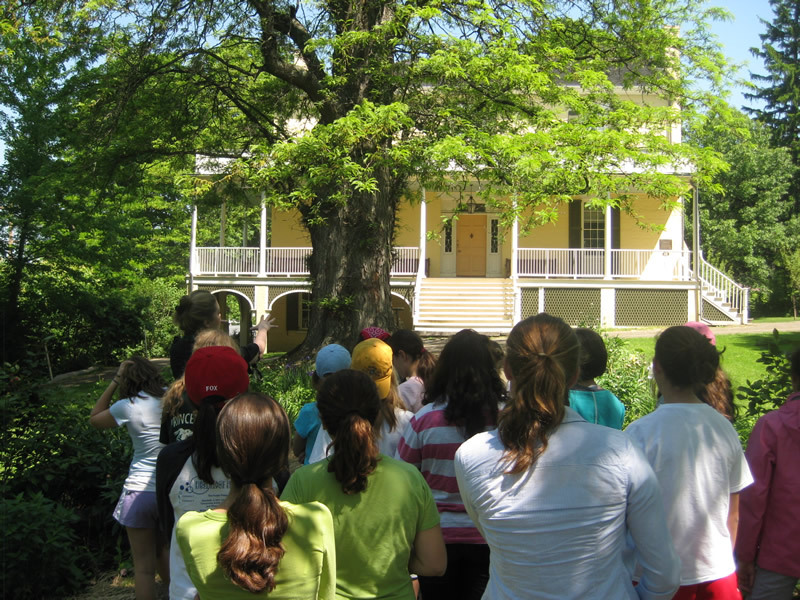 This special tour for students will pass through the historic flower garden and visit the site’s famous 200-year old Honey Locust Tree. The tour will then lead the group to the porch of the Main House, where perfect views of the Catskill Mountain range can be enjoyed. Students then enter the 1815 Federal yellow-brick Main House and tour the historic rooms where the Cole family lived, including the West Parlor where Thomas Cole was married. The Main House also includes gallery rooms, where exhibitions of art from the Hudson River School are on display. The tour continues into the “Old Studio” where Cole painted many of his best known works. The studio still contains Cole’s original easels and art-making materials. The tour also includes a visit to the “New Studio” and the special exhibition inside it. This program lasts approximately one hour and costs $4-8 per student, on a sliding scale. 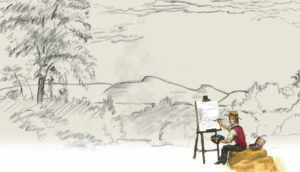 Students examine Thomas Cole’s 1839 painting studio and learn what it was like to be an artist in the 19th century. Students learn about the life of Thomas Cole, the Hudson River School of Art, and about the historic site. The students then create sketches based on their experiences and turn these sketches into original paintings. This program involves a youth tour and art project. The entire program lasts approximately 2.5 hours and the cost is $6-12 per student, on a sliding scale. School Programs are offered Wednesday through Friday 9:30am to 1:00pm, May through October. Please make your group’s reservation at least one month in advance in order to secure your desired date and time. Groups larger than 75 students may be accommodated when split over the course of two days.